Organic gardening is as old as human cultivation but many people are just discovering the benefits. With the advice this article contains, you can begin your own organic gardening adventure and create a thriving oasis that all your family can enjoy. Use what you read here to get top tips to take your organic gardening to the next level! One way to encourage an organic garden to be sustainable and healthy is to put aside a section to stay undeveloped, thus encouraging wildlife to approach it. This can be a good area for the types of insects that pollinate plants. It can also be a sanctuary for birds, which will help some plants thrive. This can greatly improve the production of your organic garden. You must consider how much light is available when starting your plants indoors. Ideally, these plants should be kept in a room that offers natural light from a window or glass door. If you still are unable to get enough light to your plants, consider purchasing grow-lights. Take your seedlings and saplings to a cooler spot once they are established. After growth begins, you can remove plants from any excessive heat sources. If you used plastic wrap to insulate your seedlings, you should now remove it. Keep a close watch on your seeds to know when to do this. Space is important to remember when planting an organic garden. It can be easy to underestimate how much space your plants will need once they begin growing. You will need to provide this space to provide ample room and because you need air circulating to your garden. Plan your garden accordingly, and make sure the right distance is between the seeds. When developing your compost pile, use equal measures of dried and green material. Grass clippings, vegetable and fruit leftovers, and grass clippings are all examples of green plant material. Dried material includes straw, shredded paper, and cardboard. Certain substances will undermine your composting efforts and cancel out any benefits; these include meat, charcoal, ash or plants that have diseases or fungal growths. You just have to be patient if you want to get your organic garden into tip top shape. 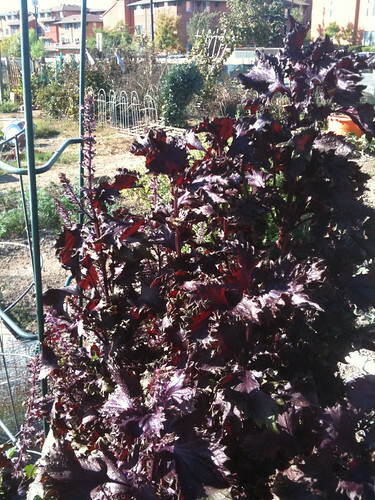 Apply the advice of this article, and enjoy the many benefits an organic garden can offer you. Regardless of which organic crops you choose to grow, these tips will help you enjoy a bountiful harvest.